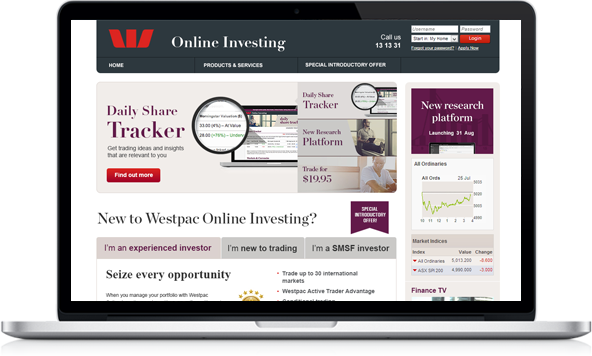 Westpac Customers can invest online and trade shares through Westpac’s Online Investing website. We worked with Westpac on the redesign and redevelopment of the new homepage following a review of the analytics of the website and an analysis of the previous homepage’s usability. We developed a prototype of the new homepage, taking into account limitations imposed by the underlying technology; from there, we designed and then developed the new homepage, ready for integration with the Westpac Online Investing website. The new homepage allows Westpac to better silo users depending on their investment intentions and reasons as well as to promote key features, functions and offers from the platform.